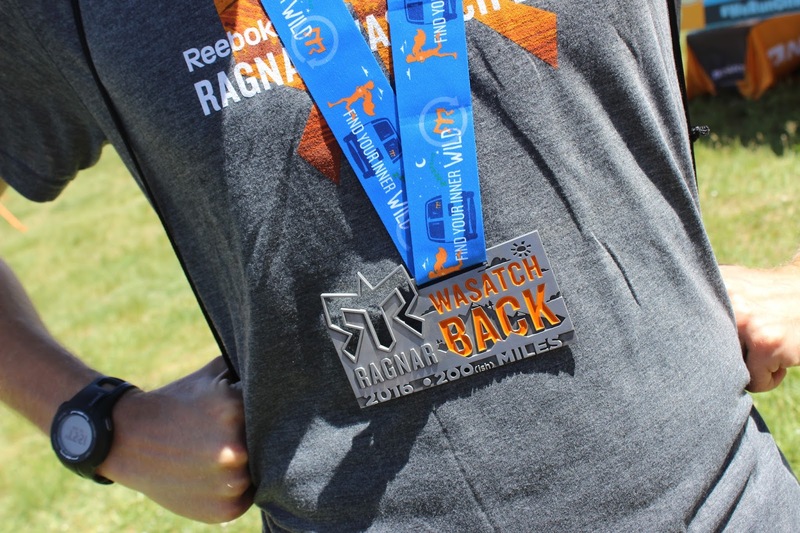 I had never done a Ragnar relay before, but last weekend, June 17-18, Cyndi and I joined a team for the 2016 Ragnar Wasatch Back. 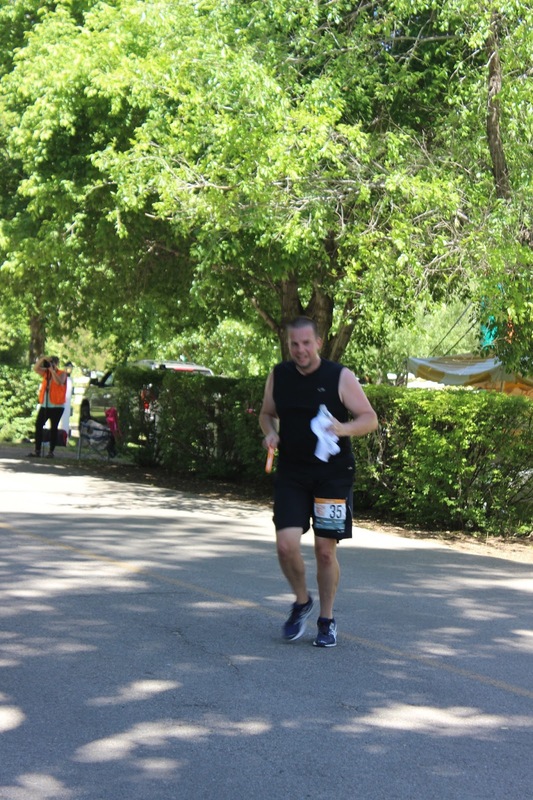 It was a different experience than my usual marathon or half marathon. Originally, Cyndi’s dad and sister were going to run on the team (instead of me and Cyndi). But her sister’s daughter had a recital the same weekend so she dropped out. Cyndi’s dad recruited Cyndi and I planned on being backup. Then Cyndi’s dad had some knee problems and family issues that arose, so that left Cyndi and me. Cyndi was acquainted with one person on the team, but I had never met any of them. I have only a little history participating in relay races. Back in 1999 and 2001 I ran in the Sawtooth Relay in Idaho when it was ~130 miles for a 12 person team. (Now it is ~60 miles for 6 people.) I was in high school for the first one. Then I was a recent college freshman for the second Sawtooth Relay on a team I didn’t know. It was pretty fun but I honestly don’t remember the details very well. Then in 2011 I ran in the Hood to Coast Relay — which was one of the first big, 200 mile, 12 person relays. 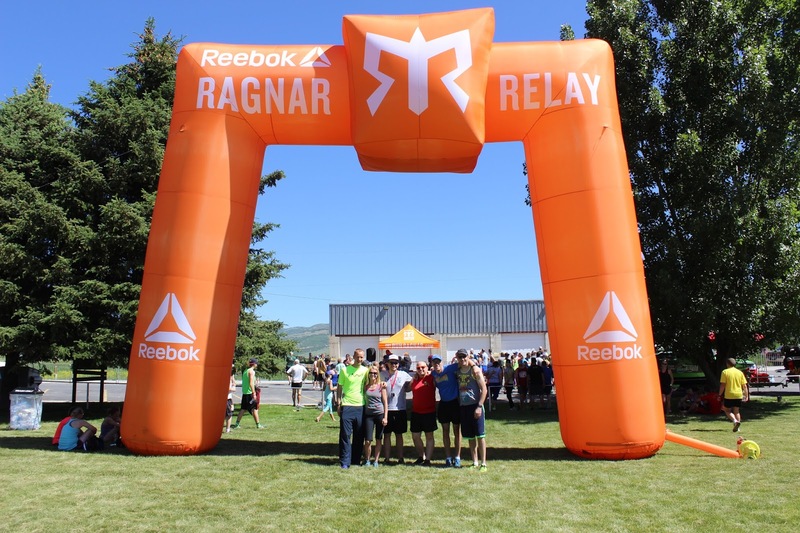 In fact, Hood to Coast inspired the Ragnar founders to create their first Ragnar. I didn’t have a great experience in that relay. That particular year, the HtC organizers added 25% more teams and the traffic was horrendous. We used my van and I didn’t get a wink of sleep all night because I was driving or staying awake to make sure the driver was alert and ok. I don’t do very well on little sleep and it showed by the end when I was utterly exhausted. I had one brother-in-law in my van that I knew, but not really well, and besides that I didn’t know anyone in our van. 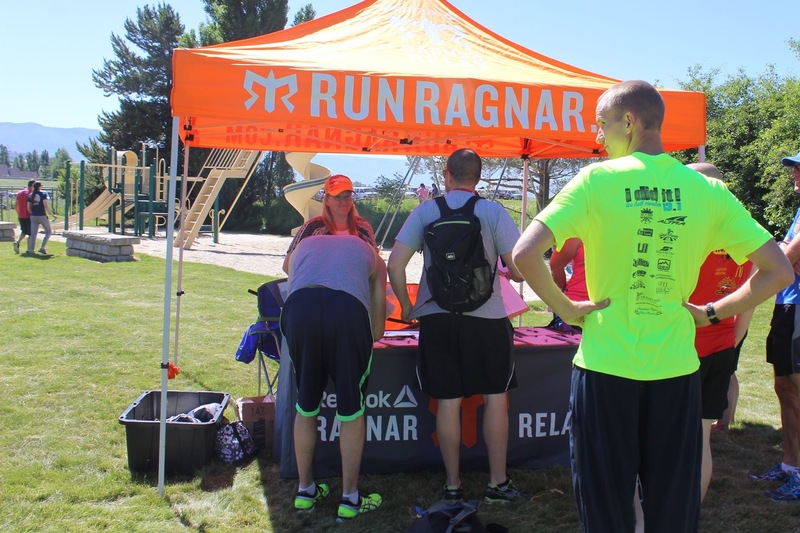 However, it has been a few years and I was ready to try another relay — especially a Ragnar which I know are quite popular. 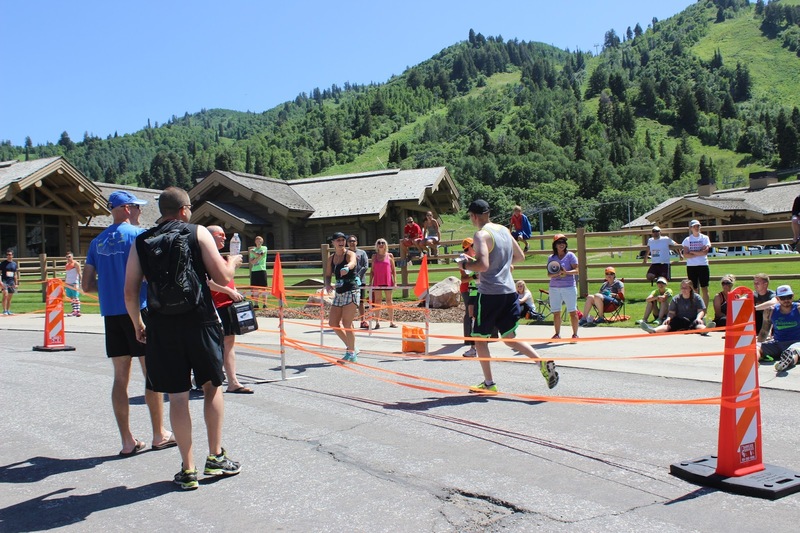 The Wasatch Back was the original Ragnar relay, and it takes place in beautiful country — small towns and cities among mountains and greenery. The elevation is mostly around 6000 feet and there are a few big climbs and descents. 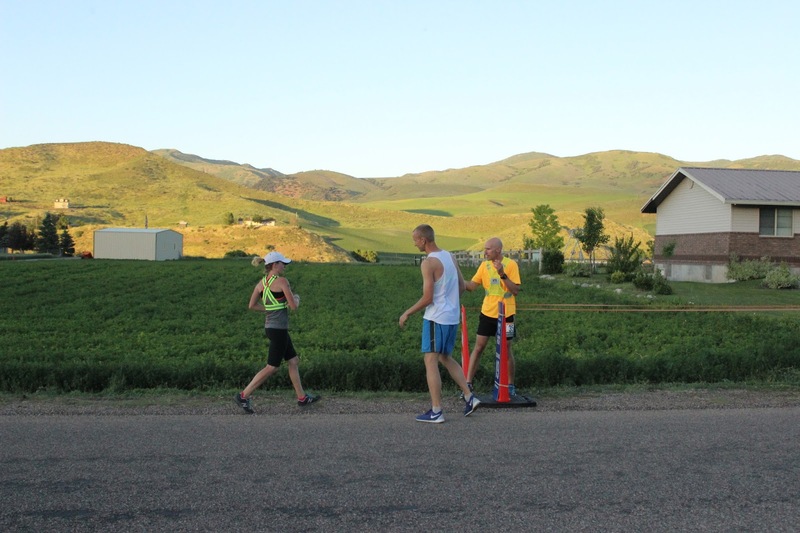 The race is basically from Logan, Utah to Midway, Utah. 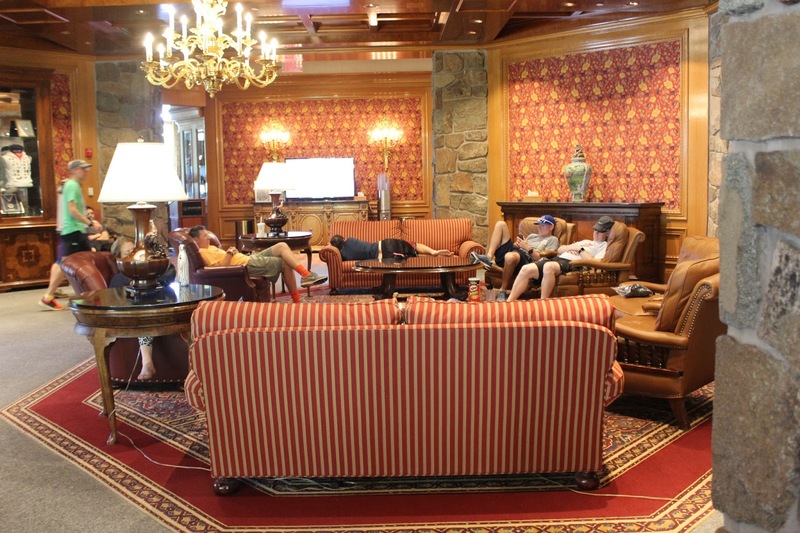 The hardest thing we had to do pre-race was to get a babysitter for our five children for 1-2 nights. This was no small task. Luckily my mom was able to watch our two youngest and my cousin, who lives on the Wasatch Front, was able to watch our three oldest. She has similarly-aged children that play well with ours. We were grateful to have babysitting arranged once we finally did, and we are very grateful to the babysitters themselves. Cyndi and I dropped off our littlest two on Thursday morning at my mom’s and headed for Utah. We got to my grandma’s house in the afternoon and chatted with her a bit. Then we left the three oldest there for a couple hours while Cyndi and I attended a team dinner at Olive Garden. Cyndi and I chatted with Grandma and my aunt and uncle for a while that evening, and I indulged in a few cookies and some ice cream. We got to bed by 10pm and after sleeping for a few hours I started tossing and turning like I normally do before a marathon. Finally the alarm clock went off at 5:30. We got ready and drove to my cousin’s house to drop the older kids. That took an hour. Then we had to double back for another hour to reach the designated meeting spot. Finally at 8:30am we met up with our van and set off for another 1.5 hour drive to our starting exchange. 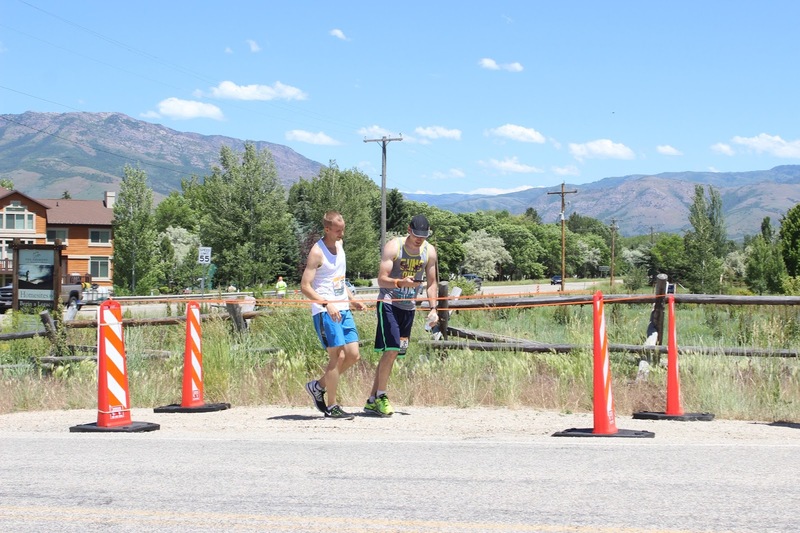 Exchange 6 — where Van 1 hands off to Van 2 for the first time — was in Liberty, UT. When we came through the canyon into the valley where Liberty resides — part of the Wasatch Back — we were immediately taken aback by the beauty of the area. Everything was green, the sun was shining, and there was a glorious mountain backdrop in every direction. 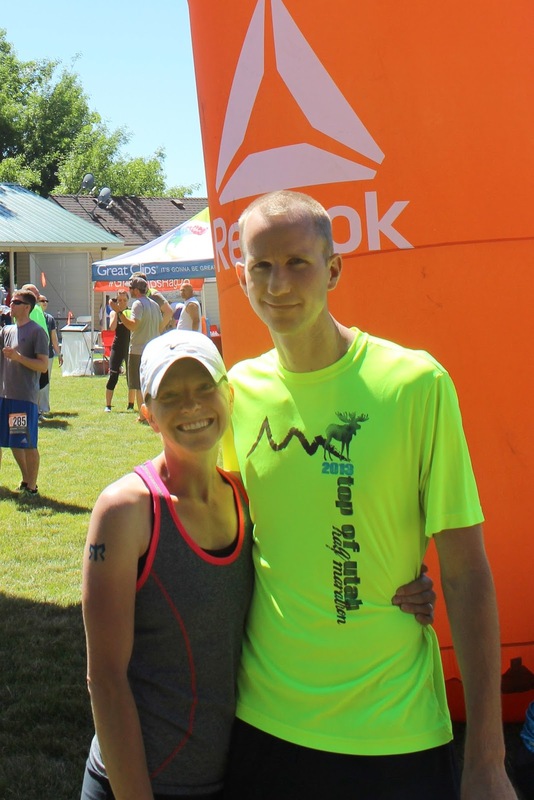 When we got to the exchange, we had to sign a waiver and watch a Ragnar safety video. Then we walked around the booths. 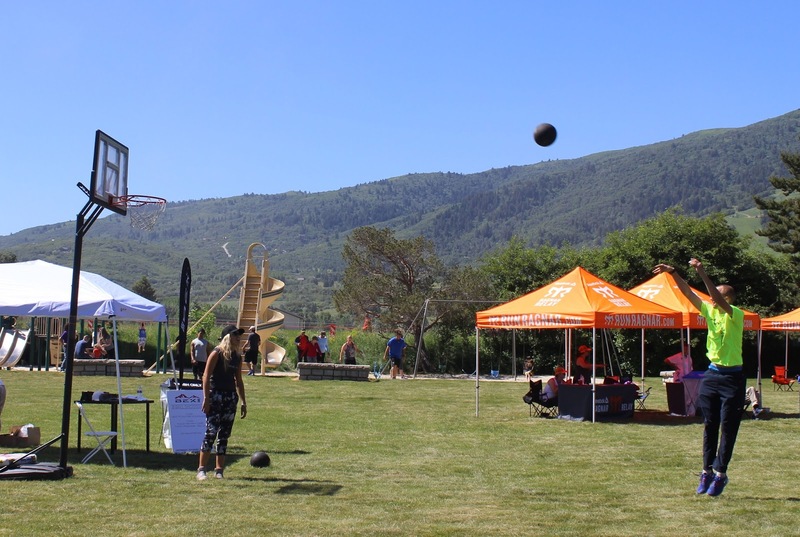 There was a booth for BEX Sunglasses with a basketball hoop and I scored a free shirt by making 4 of 5 free throws! The sunglasses are quite nice, but a little out of my price range (5 kids –> cheap sunglasses). Winning a free shirt at the BEX Sunglasses booth! Another booth was handing out samples of Halfpops, which turn out to be quite tasty. You know when you pop popcorn and there are some kernels that are only partially popped? That’s what they are. I tried about 4 flavors and liked them all. I also scored a cowbell at the Great Clips booth. 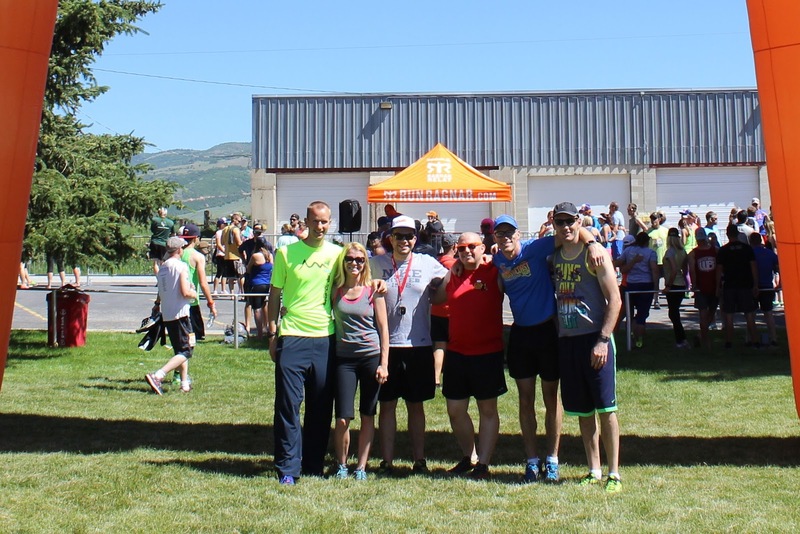 Team Aching Bad, Van 2 at Exchange 6 of the Ragnar Wasatch Back relay. We took some photos and then Van 1 showed up, except for Emily, who was running. 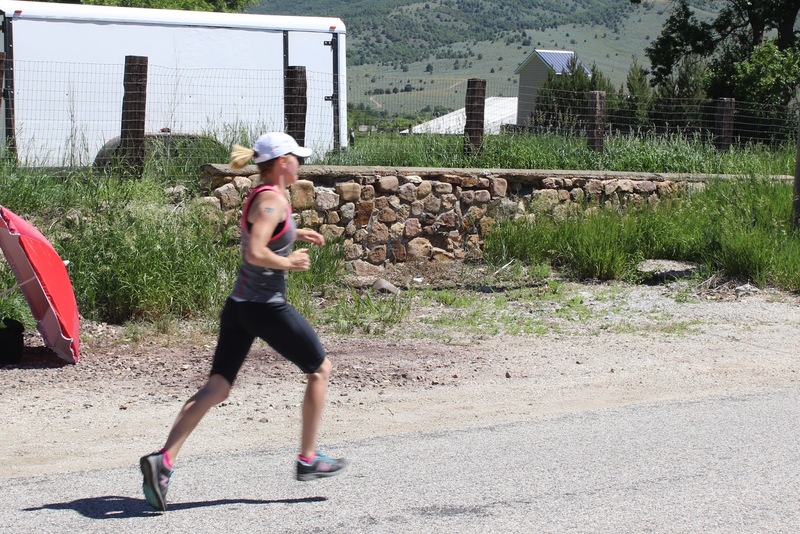 Emily coming up to Exchange 6 to finish up Van 1’s first set of legs at the 2016 Ragnar Wasatch Back relay. Van 1 had been running since 5am. 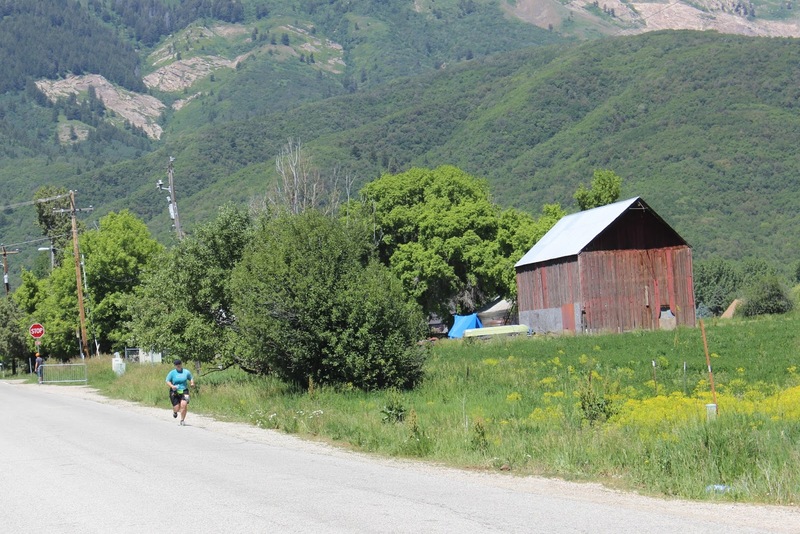 Eventually Emily came around the corner, handed off to Cyndi, and Ragnar Wasatch Back relay started for us Van 2 folks. who would hand off to Matt. It felt really hot by the time it was my turn to run. It was 1:46pm and 82F with the sun shining brightly, but something about the altitude made it feel even hotter. 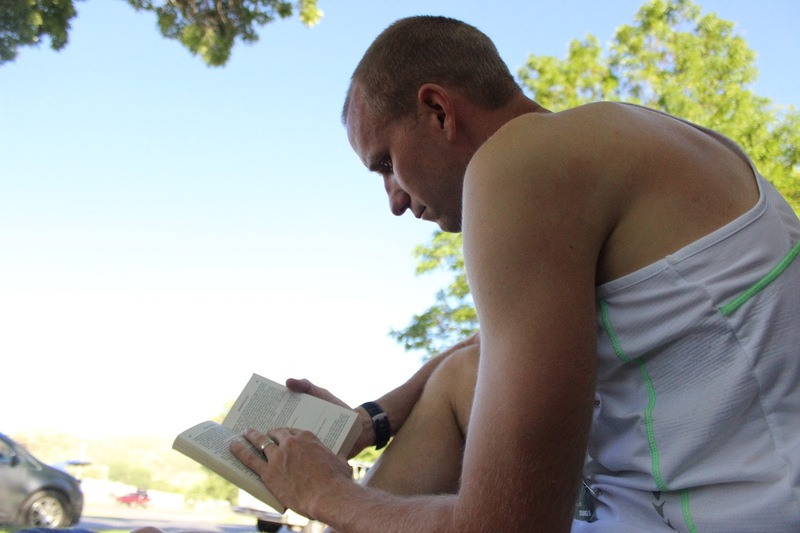 My leg, which was Leg 11 of Ragnar Wasatch Back, was only 4.4 miles long. The “10k pace” I had used to estimate my times was 6:15/mi, so that became my goal. I didn’t want to go too hard in this first leg because my next one would be more challenging, but I still pushed the pace the best I could. I did some warm ups prior to the run and I was ready to go when Kelly came around the corner. My run went by fairly quickly. I passed a few people, which made it more interesting, but we weren’t really there to compete. There was a bit of a headwind for part of it, but I averaged 6:13/mi which I was happy with. I handed off to Matt and he had the pleasure of a ~7 mile climb up to a ski resort. Our van headed to the resort to wait for him and meet up with Van 1. While we waited at the resort, I whipped out my backpacking stove and boiled some water in the parking lot so that Cyndi and I could eat some Mountain House meals we had brought along. The lodge was selling delicious looking burgers for ~$15 each, but Cyndi and I are way too cheap. 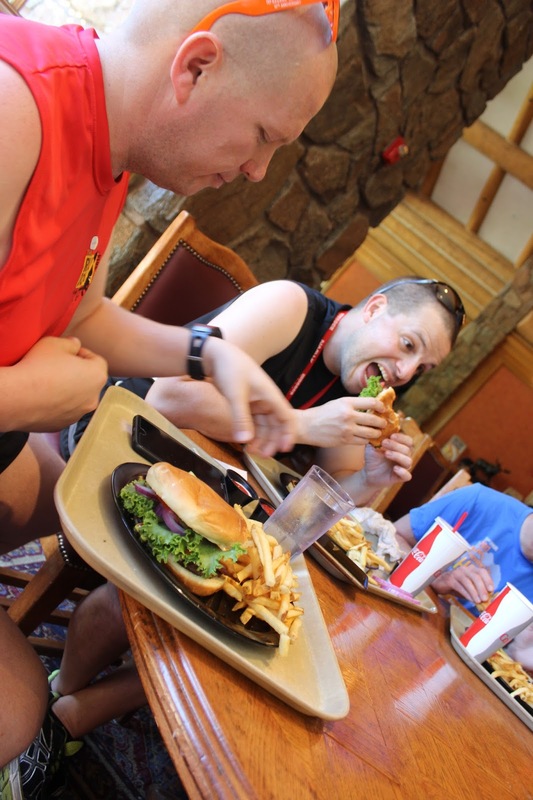 Besides, I didn’t particularly want to eat a burger in between my runs. The Mountain House meals were delicious and I highly recommend them for relays. 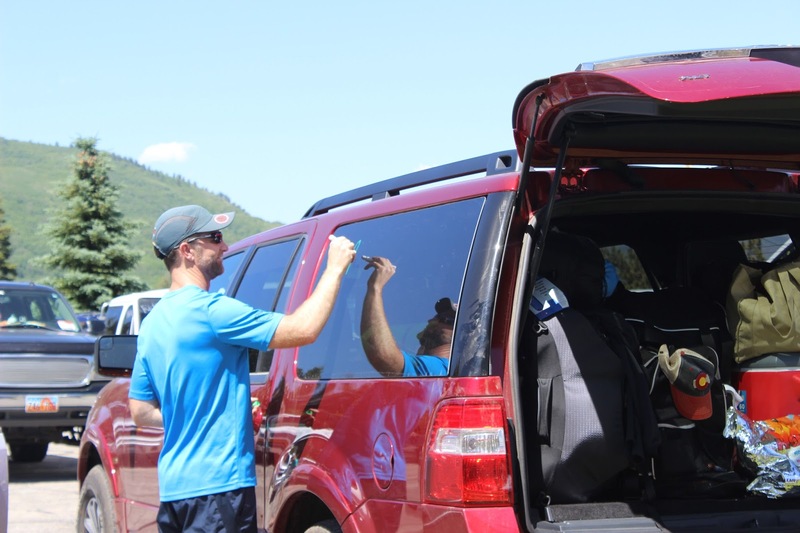 Both vans lounging around while we waited for Matt to climb the hill at Leg 12 of the Ragnar Wasatch Back relay. I’m measuring water for our Mountain House meals. Getting ready to make our Mountain House dinners! Matt was handing back to Van 1, so they were also at the resort and it was fun to be around them for an hour or so while we waited. When Matt came in and Van 1 left, Matt, Kelly, Bert, and Ben all got one of the burgers. I polished off some of the leftover fries and unwanted pickles, but thanks to the Mountain House I was pretty satisfied food-wise at that point. 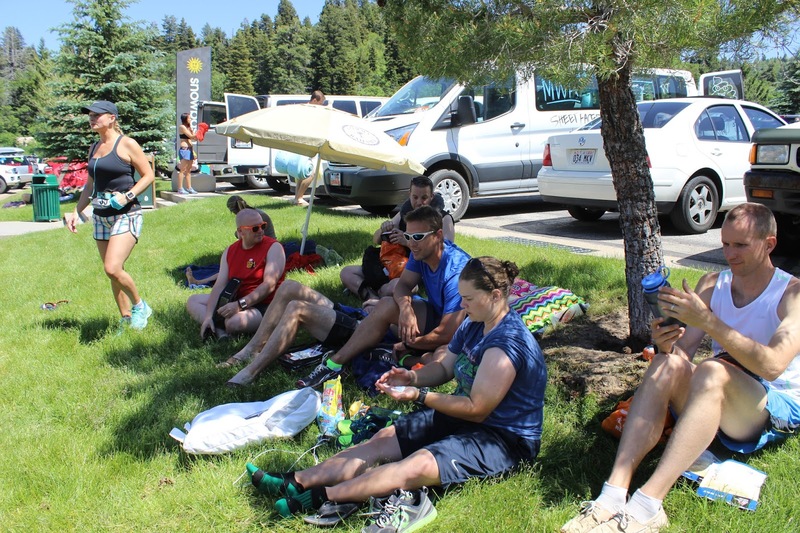 Fellow runners lounging around at the ski resort — Exchange 12 of the Ragnar Wasatch Back relay. We then made our way to Exchange 18, which was at a high school. We had about 3-4 hours of down time. 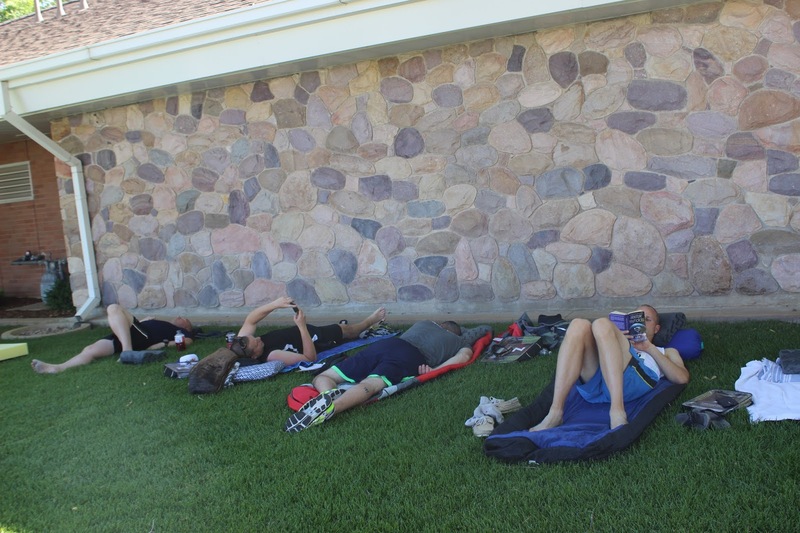 Luckily I had brought a book along, so I rolled out my sleeping bag in the shade and read my book and relaxed. The wait was quite long. Fortunately, we were noticing that our team was one of the first through, so we didn’t have to fight for shade or battle traffic. 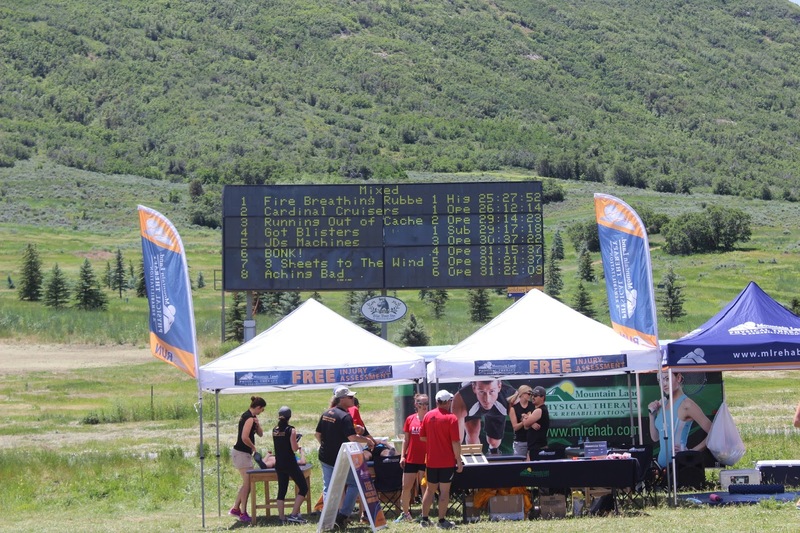 The Ragnar relay doldrums… waiting at Exchange 18 for Van 1. Luckily I brought a book. My stomach was beginning to rebel at this point. I think I was eating to many carbs and irregular junk. Next time I’ll try to bring more balanced food (i.e., more fats and protein). 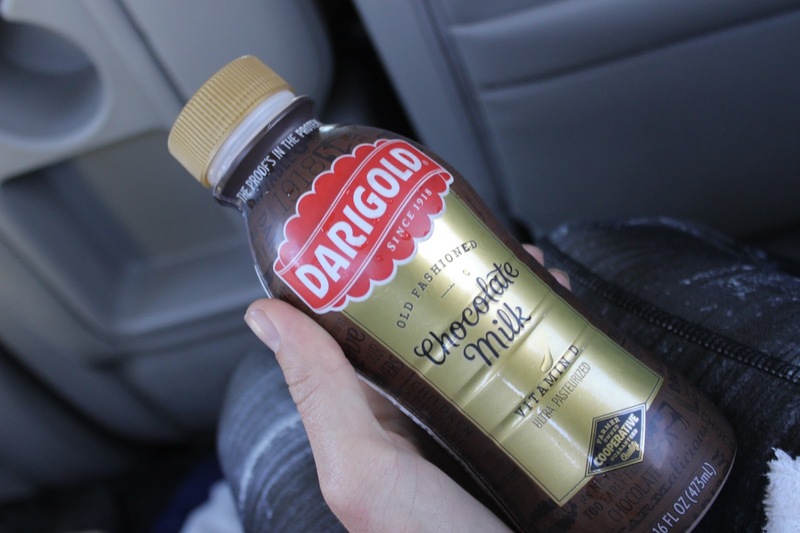 Note to self: bring more chocolate milk to my next Ragnar relay. It was hot for most of the afternoon, but by the time Van 1 pulled up and Cyndi toed the line for Leg 19, it was beginning to cool down. She had a beautiful run through green, barn-strewn country. Starting with her leg it was time to wear reflective gear and lights. 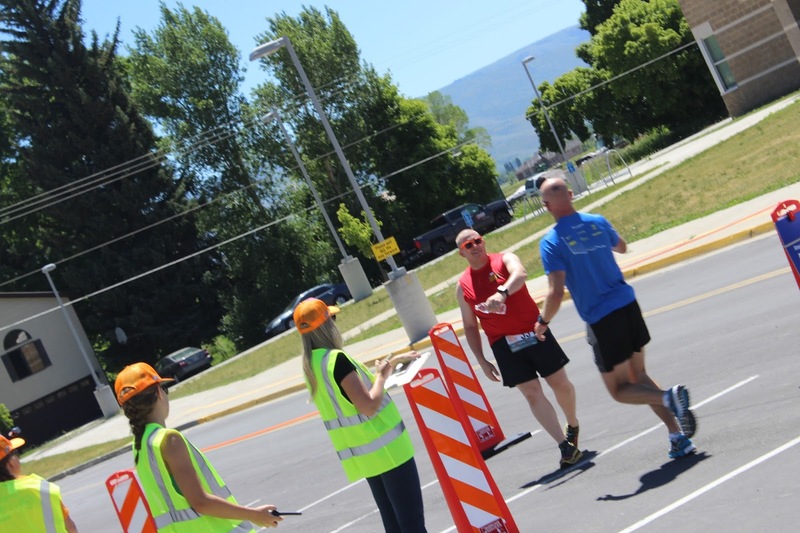 Cyndi handing off to Bert at Exchange 13 of Ragnar Wasatch Back. Note the beautiful greenery and mountain backdrop. After starting and stopping for the other runners in our van, it was time for me to run again just after 11pm. It was really cooling off, but it was actually great running weather and I continued sporting my tank top. I noticed some people leave for their run in full hoodies and I knew that was a mistake. My stomach was rebelling, but it hadn’t gotten bad enough that I was too worried about it. I put some TP in my pocket just in case, but I ended up feeling fine once I got going. 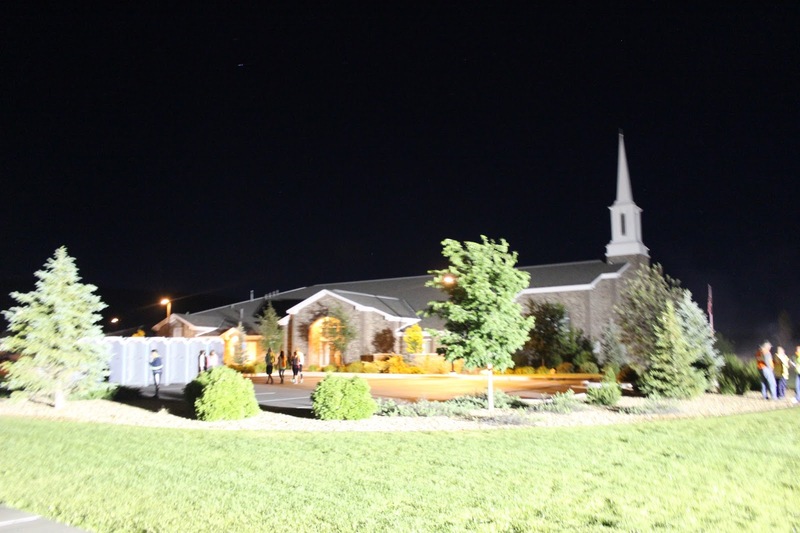 LDS chapels made for nice exchange points, including the hand-off to me at Exchange 22 of the Ragnar Wasatch Back relay. This leg was nearly 10 miles (I measured 9.62, but started my watch about a quarter mile late). It was dark. The darkness didn’t matter until I had to start running on some trails and I had to pay extra attention to where I was stepping. The terrain varied between road, weedy gravel trail, rutted dirt trail, and weedy sandy trail. I asked my van to give me some water around Mile 3 to make sure I was OK, and at that point I told them I’d be find for the remainder. I also took a Honey Stinger to provide an extra boost. I tried to push the pace, but between the trail and some slight elevation gain, not to mention the altitude, I wasn’t able to maintain 6:15/mi. At one point I wasn’t sure I was on the right trail, and the insecurity slowed me a bit. However, I still hit 6:41/mi and fortunately my stomach felt fine during the run. It was enjoyable to run under a bright moon in the cool mountain air. I pushed myself and worked to maintain a good pace. I passed about a dozen people, but most of the time I couldn’t see any other runners around. It was always a relief to see someone as that gave me confidence that I was on the right track. 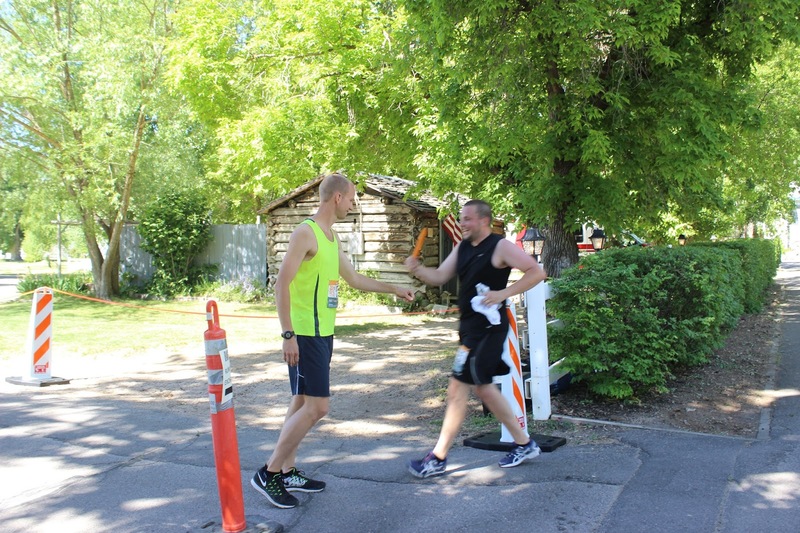 I was happy to hand off to Matt and be done with my toughest leg. Matt had a short ~2.5 mile run and was done at about 12:30am. 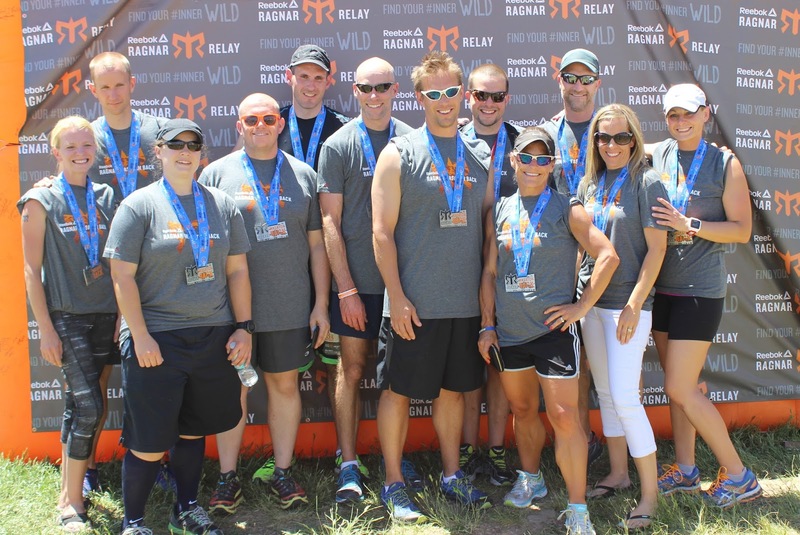 Unfortunately, the Ragnar folks notified us that our team was being held for 1 hour. This means that the Van 1 runners had to wait 1 hour before they would be allowed to run. That really stunk for them, as they were ready to go when we got the notice. We weren’t thrilled about the delay. Ragnar had given us a spreadsheet with our estimated exchange times, and we were only 15 minutes off. Plus, we were actually 15 minutes late rather than early, so it didn’t make sense that we would be delayed. Oh well. There are perks to being one of the first teams through, but there can also be downsides. We were at a high school, and my team was nice enough to let me take a shower even though everyone else just wanted to hit the road. The locker room shower cost $2, but it was money well spent. It felt fantastic to get clean and get in some warm water. I hurried and we took off for Exchange 30 once I got back to the car. It was after 1am at this point and we were all exhausted and delirious and looking forward to sleep, but this led to some foolishness. We pulled into Exchange 30 at Park City and we were the first van there. It was a dirt/gravel lot, so we parked the van… and then we just slept. There was no grass in sight and half the people in the van were already asleep, so we didn’t want to wake everyone up. Rather than getting out and laying down in our sleeping bags, we just slept uncomfortably in the car and tossed and turned all night. Fortunately I was tired enough that I could sleep some; unfortunately I am 6’4″ and sleeping in the back seat of a van is not comfortable. I was happy when we could finally wake up and stretch our legs. My stomach was also feeling much better. I heated up some water on my stove in the parking lot and made some oatmeal and hot cocoa which tasted amazing and soothed my stomach even more. I noticed there was a roped off area with about 50 people in sleeping bags on the hard gravel. I’m not sure I would have slept much better there since I didn’t bring a pad. 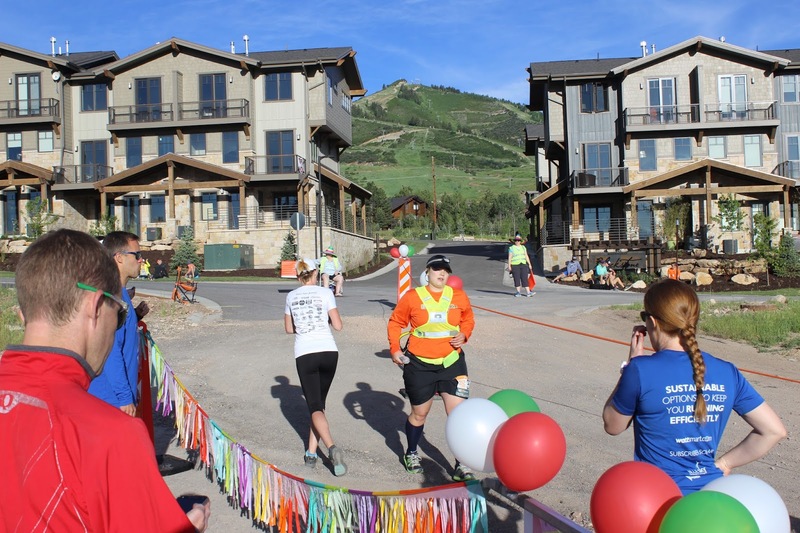 Emily handing off to Cyndi in Park City at Exchange 30 of the Ragnar Wasatch Back. Van 1 showed up and we waited for Emily to come up the hill. Cyndi took off after Emily showed up and we were all ready for our final legs. Van 1 got to go relax and have a big breakfast after a long night of running. Bert was up for Leg 32 — the Ragnar hill. It started at the bottom of a ski resort and climbed about 3000 feet in 5 miles to the top, then dropped several hundred feet for the last mile. He said much of it was not runable because it was so steep. He did great on it and got his own medal for doing it. The next two legs were super steep downhill and about 4 miles each. Leg 35 – Almost done! I had a short 2.5 mile leg to finish up. It was nice that I didn’t have to worry about it, although I would have welcomed something a little more challenging. I determined to go as fast as possible. Waiting for Kelly to finish up his legs. How much time did we spend waiting for runners to come in? Lots. The anticipation is tiring. We waited a little longer than I had anticipated, so luckily Ben spotted me some Mike & Ike’s as I was feeling a little hungry and light headed. Once Kelly came around the corner, I took off at a brisk pace. I was well under 6:00/mi, so I determined to try to stay under 6:00 for the whole run. 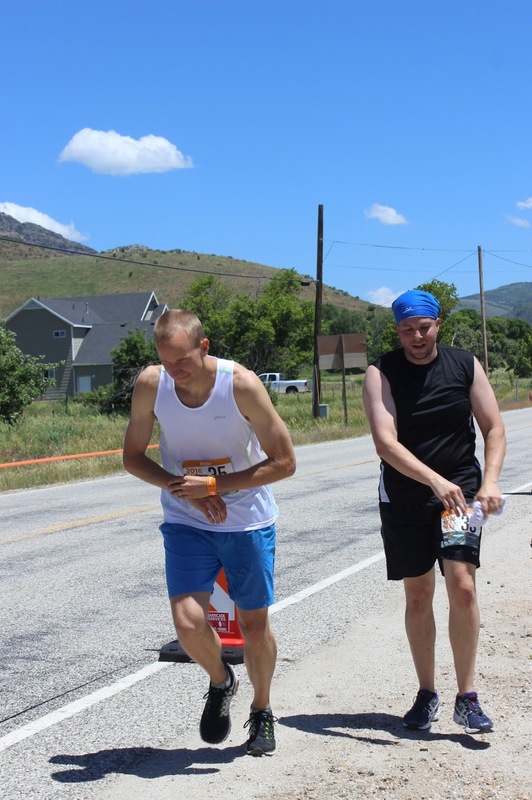 Kelly handing off to me just before my last leg — Exchange 34 of Ragnar Wasatch Back. I only passed a few people as runners were fairly spread out and it was short. I felt good the whole run and was pleased to come in at a 5:59/mi pace. 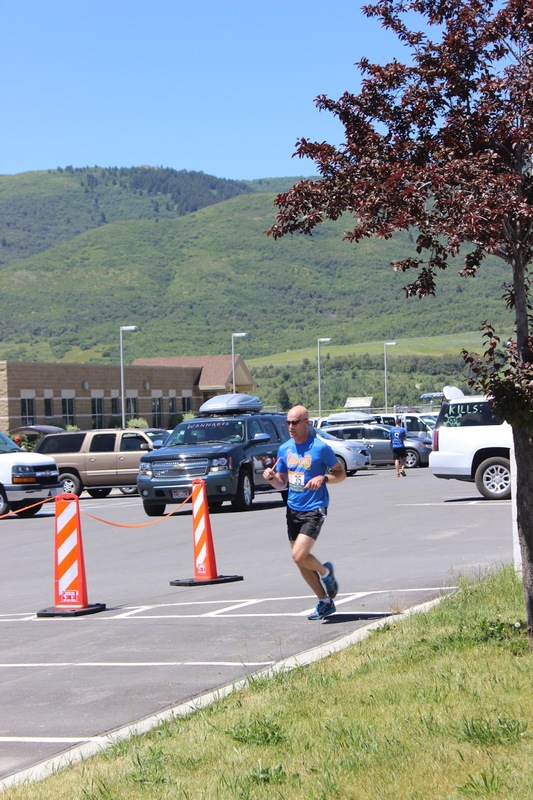 That wrapped up my running for the Ragnar Wasatch Back relay, and I felt great. We headed to the finish line to wait for Matt. He had a tough run as the temperature was heating up, the sun was out, and he had some hills to battle — not to mention his run was ~1 mile longer than expected. The finish line is a bit of a party. There were a bunch of booths set up. Each van got a Little Caesar’s pizza. There were also Fat Boys and Muscle Milk. BEX Sunglasses was there again. I arrived as most of the BYU team had finish attempting shots. Since none of them won anything, the BEX team told them whoever won a game of Bump could get a free hat. Bert and I joined in. I missed a shot and immediately got out. Bert lasted a while before losing out. Fortunately I made 3 of 5 three pointers and was able to get a nice hat to go with my shirt from the day before! 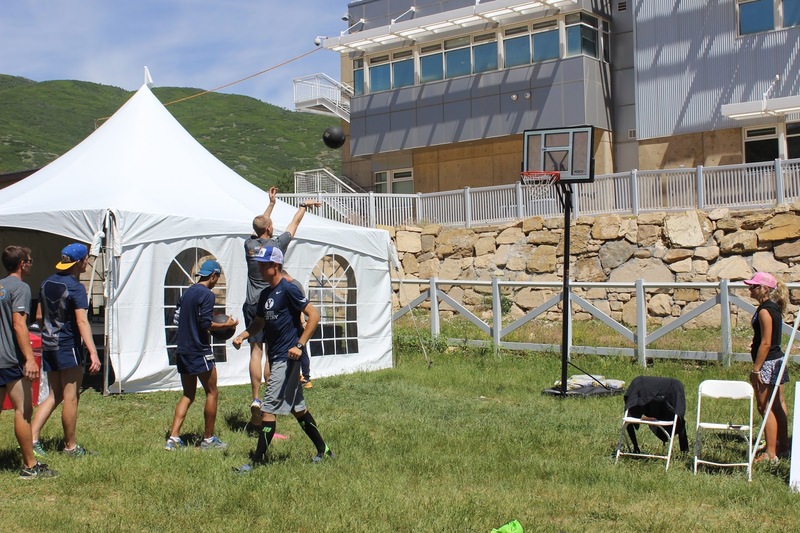 Playing a game of Bump with the BYU team. Winner got a hat from the nearby booth. I missed my first shot and lost, but then I redeemed myself by making 3 of 4 three pointers for my very own hat. When Matt came through our whole Aching Bad team joined him for the final 50 yards or so. It was great to be done after ~200 miles! We received our medals and snapped some team photos. Since we were one of the early teams to finish, we even made the scoreboard for a few minutes. 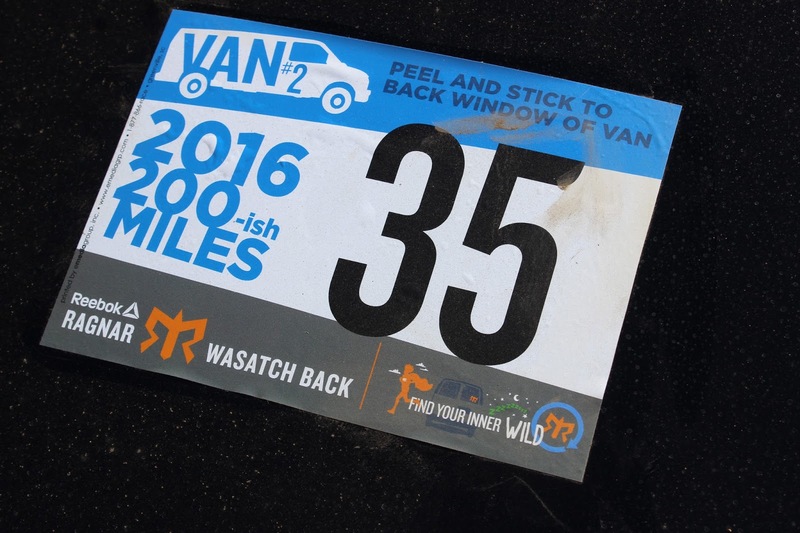 Overall I had a solid experience in the 2016 Ragnar Wasatch Back Relay. Relays are definitely a different experience than the races I usually do (marathons and half marathons). 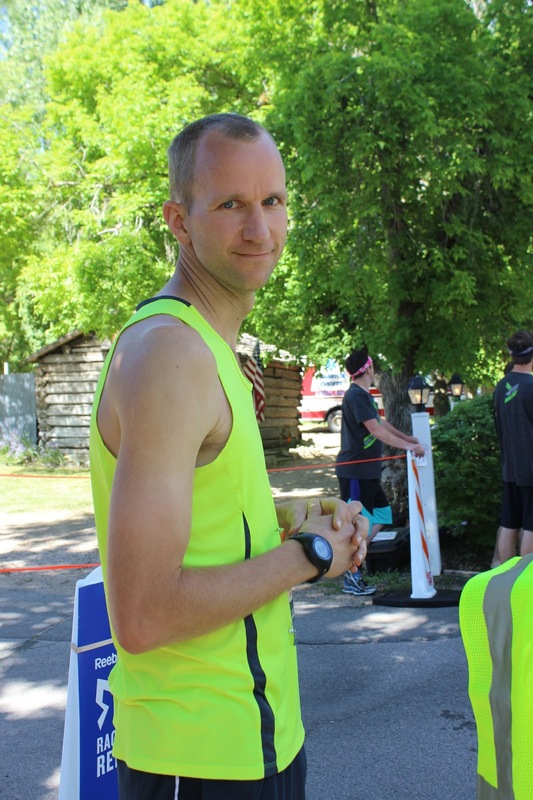 The running isn’t terribly difficult, especially compared to a marathon, but there are other things that make it difficult: lack of sleep, all the anticipation and waiting, being on your feet quite a bit, unusual running times, being crammed into the seat of a van, being dirty, and abnormal eating conditions. All of these things make for an exhausting experience, and provide a unique challenge. Cyndi and I, who are both mostly introverted, determined that relays work really well for extroverts. The people on your team make a huge difference. The guys in our van were funny and entertaining. There were lots of jokes, good music, funny commentary, and even a battle to see who could get the most steps on Friday between Bert and Matt (Matt edged Bert out by ~200 steps). We were fortunate to have a good team, and I think that made this experience such a good one. Being in Van 2 helped as well, at least in this case. We had time to drop our kids off in the morning and didn’t have to wake up as early. We also didn’t have to run all through the night. And the event was ~4 hours shorter for us than for Van 1. 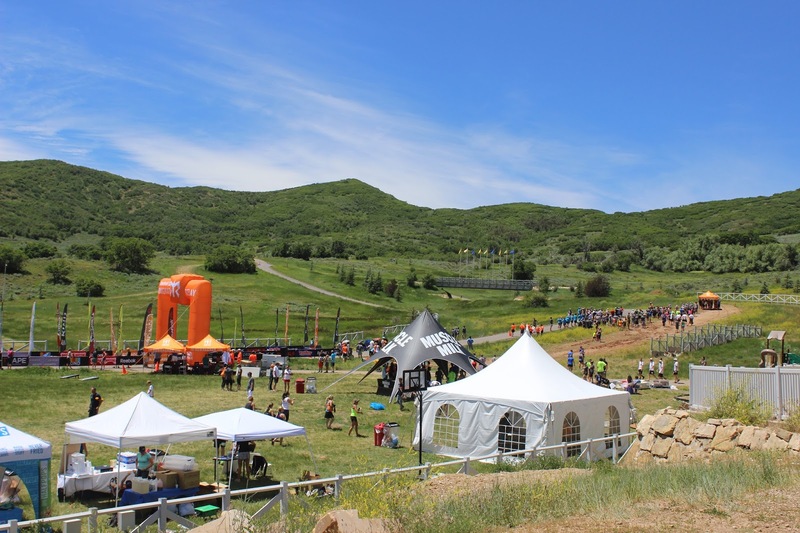 Would I do the Ragnar Wasatch Back again? Yes. Would I do another (different) relay? Yes. But I don’t expect to dedicate myself to running them like I have to marathon running. Relays are fun and some people absolutely love them. Bert has run Hood To Coast 21 times and multiple Ragnars in addition to that, so obviously some people love them. I enjoyed it, but marathons are much easier logistically and are more up my alley. 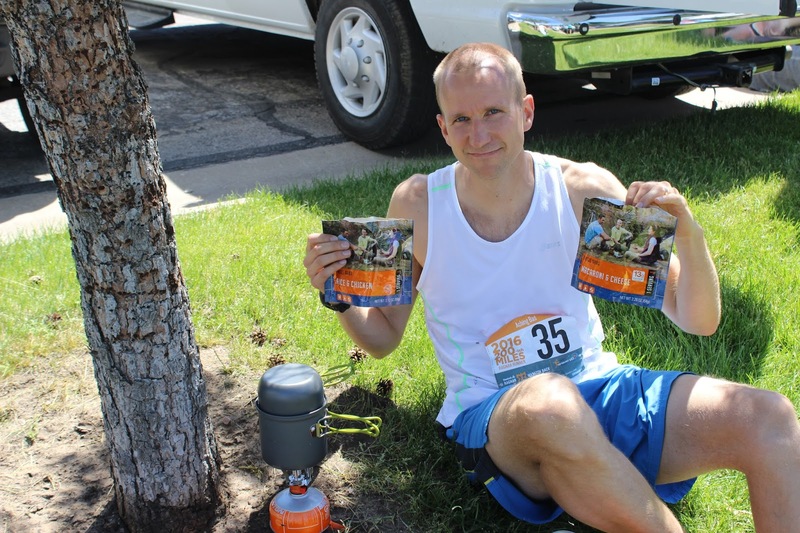 Previous Previous post: Race Report: Famous Idaho Potato Marathon 2016 – PR and BQ!